Melting permafrost. Picture: Penn State Institute of Energy and the Environment. Last week, the web site Climate Denial Crock of the Week posted a very important video (which I’ve embedded below) about the state of our planet’s permafrost. Now, if you remember your high school geography, the permafrost is found in the northern parts of North America and Asia. And as the name suggests, it is soil that is supposed to be permanently frosty (or frozen). Unfortunately, as the globe’s temperature increases because of our greenhouse gas emissions, the permafrost is beginning to melt. This is important because “as permafrost thaws, the organic matter in the permafrost thaws as well and begins to decay. The microorganisms start to eat it. If there’s no oxygen, the microorganisms make methane. If there’s oxygen, the microorganisms make carbon dioxide.” Both methane and carbon dioxide are greenhouse gases. 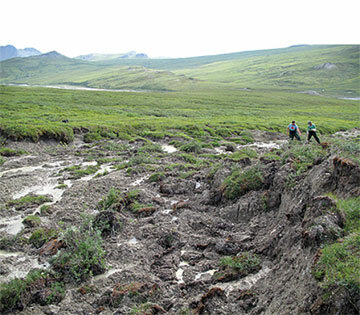 The state of our permafrost is of great concern for two reasons. First, as Nobel Prize (in physics) winner Steven Chu mentions in the video, “once this starts, the amount of greenhouse gases released could be larger than, even dwarf, the amount of greenhouse gases that humans are putting in the air now.” Second, a study by Dr. Anton Vaks, of Oxford University, has concluded that the temperature at which the “the continuous permafrost starts to melt”, also know as the “tipping point”, is 1.5 degrees Celsius above pre industrial temperatures. And we are already at +0.8 degrees C.
Just one more reason (as though we needed more) to bring our emissions down to zero as soon as possible. FYI: I’ve just been exchanging e-mails with Anton Vaks, the lead author of this report. The paper originally came to my attention via Climate Central, in which it was stated that the 1.5c rise was from the present. This also popped up in a Scientific American article on the paper and other places. Then I saw The Guardian and your post talking about 1.5c from pre-industrial global mean temperature. At that point, I shelled out $20 to buy the article, and this appeared to clearly state that the 1.5c was from pre-industrial. Just to confirmed I double checked with Anton Vaks himself. He came back and confirmed that, yes, the tipping point for northern latitude permafrost melt was 1.5c from pre-industrial. He also went back and checked the press release from Oxford University and told me that there was an ambiguous statement within it that had caused the incorrect reporting by Climate Central and others. The press release has now been amended. The bad news, of course, is that the lower hurdle for the tipping point makes action even more urgent. In a sane world, this would be front page news all over the planet. Instead, I read about it on Climate Denial Crock of the Week. Don’t get me wrong, I think it is a great blog… but it’s still a BLOG! No one is really taking these ‘tipping points’ seriously, because not many people are well informed on what a tipping point is and what that would mean for life on earth. If we disturb the Gulf Stream through rising sea levels, for example, we will have completely lost control over the climate on earth and it is not likely many would survive. This information simply needs to break into more mainstream media outlets. Same, it’s worth a try.